Remembering the Beatles' Greatest BBC Session . Beatles Radio: The Beatles, Solos, Covers, Birthdays, News The Fab 4 and More! There always comes a time when the learner tries to compete with, and become, the master. It happened with Van Gogh and Millet, Beethoven and Mozart, Kobe and MJ, Darth Vader and Obi-Wan. 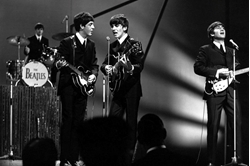 It happened with the Beatles on July 2nd, 1963, at London’s Maida Vale Studio, where the band were taping their fifth installment for the BBC of their Pop Goes the Beatles radio series. The Beatles were deep into their tenure as BBC regulars at this point. They would field requests mailed in from fans, blast through a raft of covers, some of which they’d never return to again, work in originals from their own burgeoning catalogue, and joke with the presenter, and, of course, themselves. It was a band as human jukebox, capable of excelling in all styles, while also dishing out that particular brand of Beatle-y jocosity.